Well, there are many popular blogs running on Blogger Platform. As you get increasing hits of visitors and authority, you should have full control over your blogger blog. Its important to backup blogspot blogger blog.You can backup blogspot blog with this tutorial easily. Its easy to Backup Blogger Blogs. As compared to wordpress backing procedure, its almost same process to backup blogspot blogs. If you are running on WordPress, we already have guide how to backup wordpress blog completely. Ok, then lets start with this simple tutorial on how to backup blogspot blogs easily. So, here you go. Sign-in to your blogger account and open the dashboard of the blog you want to have a complete backup of. You can only backup one blog at a time, means there is no option to backup all of your blogger blogs at once. So, if you want backup a lot of your blogger blogs, then you will need to to repeat this procedure again and again. So, after logging in to your blogger account, choose one blog you want to backup, and jump into the settings pane from the left menu. Just there in the settings dashboard, at the top you will see three option including “Export Blog”,”Import Blog” and “Delete Blog”. Click on Export Blog option and then click on “Download Blog” when you get to see the above pane. It is the easiest way to backup blogspot blog, which you can restore or merge afterwords. Its also important to backup blogspot or blogger template of your blog otherwise you will loose all your customizations you have made in the blogger template. 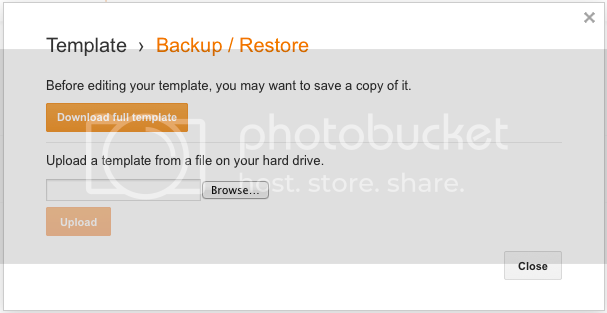 Its again very easy to backup blogspot template, what you have to do is jump to template section and click on “Backup/Restore” option using which you can backup your blog template file along-with all your customizations and CSS.